As an archivist working with military materials, it is always a joy to be able to connect a historic item with an actual military location and person. For today’s post, we would like to share this original World War I 94-page pocket Army Song Book, U.S., published in 1918 by the U.S. War Department Commission on Training Camp Activities. 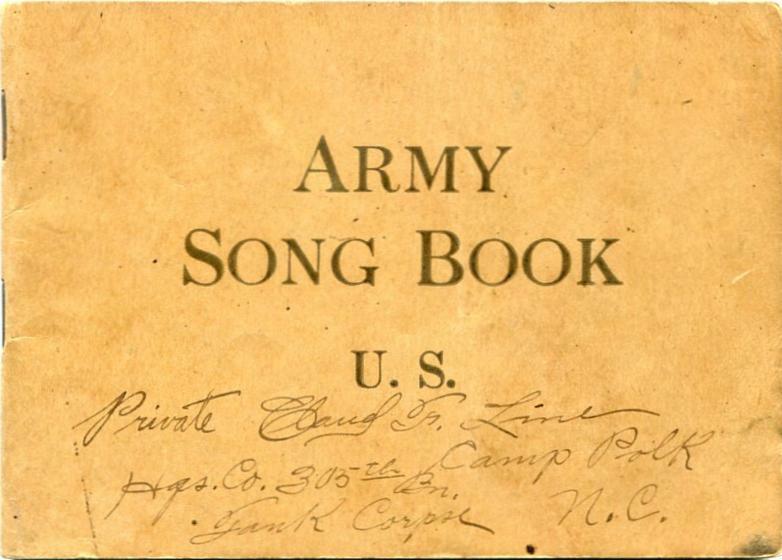 The songbook was intended for use in military training camps by newly-drafted or enlisted servicemen, with the songs to be sung during marches, or to offer musical distraction for a soldier through the mundaneness of camp life. These Army songbooks are quite common, but this particular one is unique. An inscription on the songbook’s cover denotes that it was owned and used by a Pvt. Claud F. Line, a member of the Headquarters Company, 305th Battalion, while it was stationed at the newly-constructed U.S. Army Tank Corps school at Camp Polk in Raleigh, N.C., around 1918. Camp Polk was a tank training facility established in Raleigh, N.C., by the U.S. federal government in September 1918 as part of the mobilization effort for World War I. The camp was requested to be constructed by a committee from the Raleigh Chamber of Commerce, headed by John Beaman, who went to Washington, D.C., on August 1, 1918, to make the request of the U.S. War Department. The installation was named for William Polk, Revolutionary War colonel and prominent Raleigh resident. A temporary camp was immediately needed for the Army men to be stationed there, so the War Department reached a deal with the directors of the North Carolina State Fair Grounds for the use of their grounds and buildings as a temporary camp site until the permanent Camp Polk could be completed. A formal lease was executed on September 1, 1918. The U.S. Army promised to make alterations and repairs to the Fair Grounds buildings, and the construction of bath houses and latrines for the soldiers. The Army also planned for improved sewer systems and water systems (including increasing water pressure). Scofield Engineering Company of Philadelphia, Pennsylvania, received the engineering contract to build the various systems in support of Camp Polk. Hollady-Crouse Company of Greensboro, N.C., was awarded the construction contract for Camp Polk; the company began building the camp on October 14, 1918—less than a month before the Armistice for WWI. The temporary camp site for the U.S. Army Tank School was composed mainly of tents to house the men, and temporary buildings for class rooms and barracks. When it became evident that the camp would not be completed in time for winter, the Army had 500,000 feet of lumber ordered and deposited at the site to be used as floors and siding for the Army tents. Almost all of the labor used to construct the camp was local. A daily train operated from Raleigh to the small community of Method (along present-day Hillsborough Street near the State Fairgrounds), carrying about 100 men to work for the construction company. With the Armistice on November 11, 1918, the camp never was completed to be to the degree for which it was intended. After the war, the tract became the Camp Polk Prison Farm, opened in 1920. Much of the original Camp Polk has been taken over by the North Carolina State Fairgrounds just west of downtown Raleigh and North Carolina State University. A historical roadside marker now notes the site of Camp Polk in Raleigh, N.C.